If you’re like me, you don’t allow artificial dyes in your home. This goes for the food coloring and egg dyes. Nothing good can come of this stuff. Last year was my first attempt at naturally dying eggs. I kept it simple and just tried some foods I had on hand. The results were pretty good but this year I wanted to do some more experimenting. I felt kind of like a mad scientist cooking up all kinds of brews in my kitchen/laboratory. It also smelled pretty interesting: a combination of cabbage, onions, berries and turmeric. Yum right? This year, I was really pleased with the results. I got some very vibrant colors and almost all of my dyes worked! The losers were cranberries and red onions. The cranberries caused a weird reaction and formed a slimy film all over the egg. I ditched that one. The red onion dye worked fine but just made a dirty brown color that wasn’t very spectacular. You’ll notice the only color I didn’t make was green. I didn’t find a good food source that would make green dye. Although I didn’t try it, I’m sure you could use a combination of blue (purple cabbage) and yellow (turmeric) to get a pretty green. Next year I’ll have to try it. Combine 4-5 thinly chopped beets with 2.5 cups of water. Simmer for 30 minutes, strain and cool. Add 1 tbsp of white vinegar for every cup of dye. 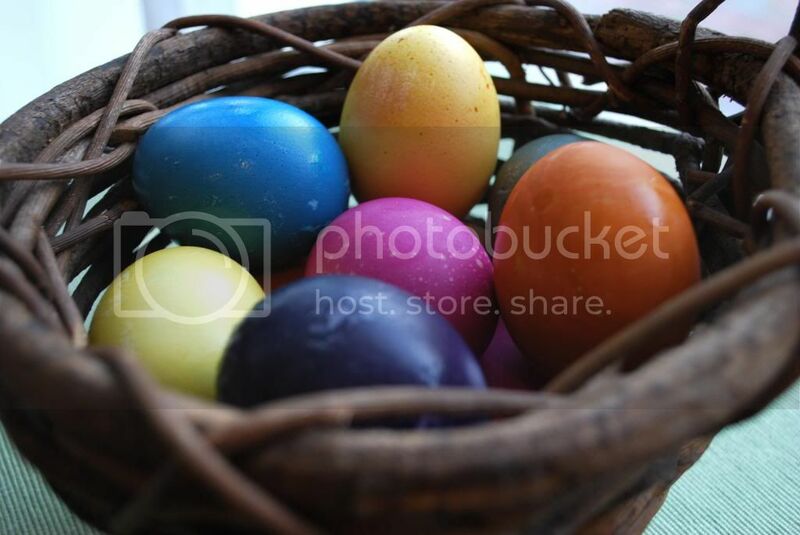 To dye: leave egg in dye for 5-30 minutes depending on the shade you want. You’ll get a light pink after 5 minutes but for the vibrant pink you see in the photos, you’ll want to leave the eggs in for 30. Combine outer dry skins from 5-6 onions and 3 cups of water. Simmer for 30 minutes, remove peels and cool. To dye: leave egg in dye for 15-45 minutes. For a lighter peach, 15 minutes will do it. If you want bright orange, leave the eggs in for 30-45 minutes. Note: You only need the outer dry skins from the onions. You can pull these off of your stash of onions but I raided the onion bin at the grocery store and nabbed a bunch of dry onion skins. Combine 2 cups of water with 4 tsp of turmeric. Simmer for 15 minutes and cool. Strain through a coffee filter if desired (not necessary). To dye: leave eggs in dye for at least 30 minutes. Depending on the strength of the dye and color desired, you may need to leave your eggs in the dye for a couple of hours. I was able to dye one egg and get a vibrant yellow after 30 minutes but the second one needed to soak in the dye over night to become bright. Combine 2 cups of water with 1 ½ cups of frozen blueberries. Simmer for 30 minutes, strain out blueberries and cool. 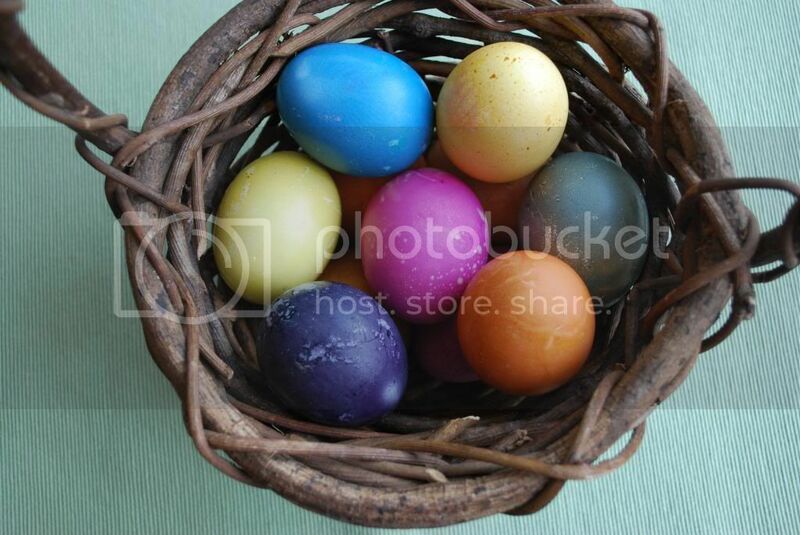 To dye: soak eggs in dye for 15-45 minutes. 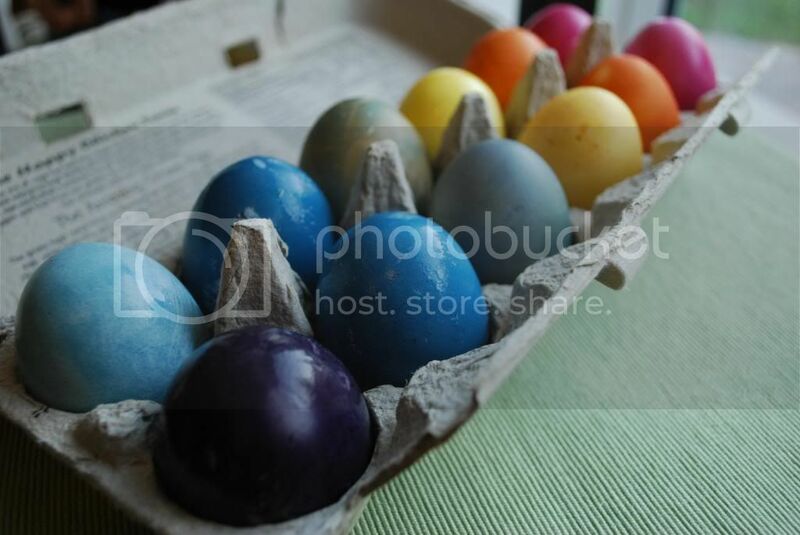 Eggs will look navy blue or purplish but will fade to blue-green. 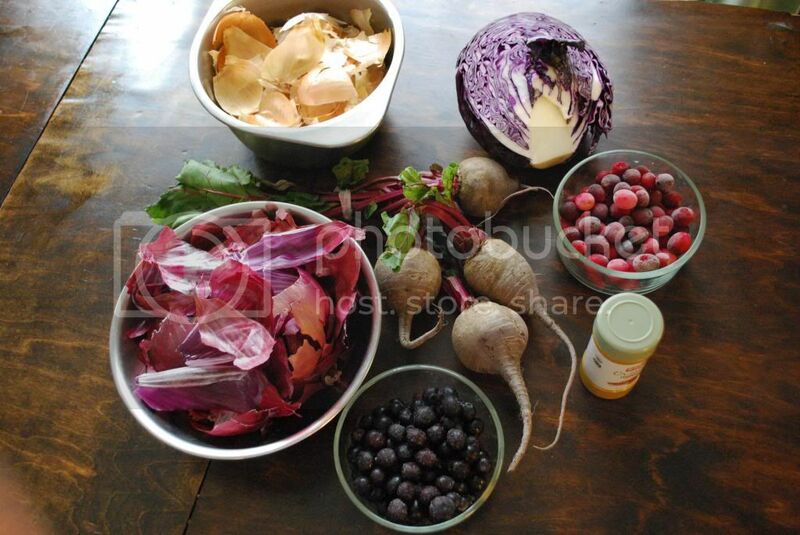 Combine 4 cups of water with ½ head shredded purple cabbage. Simmer for 30 minutes, strain out cabbage and cool. 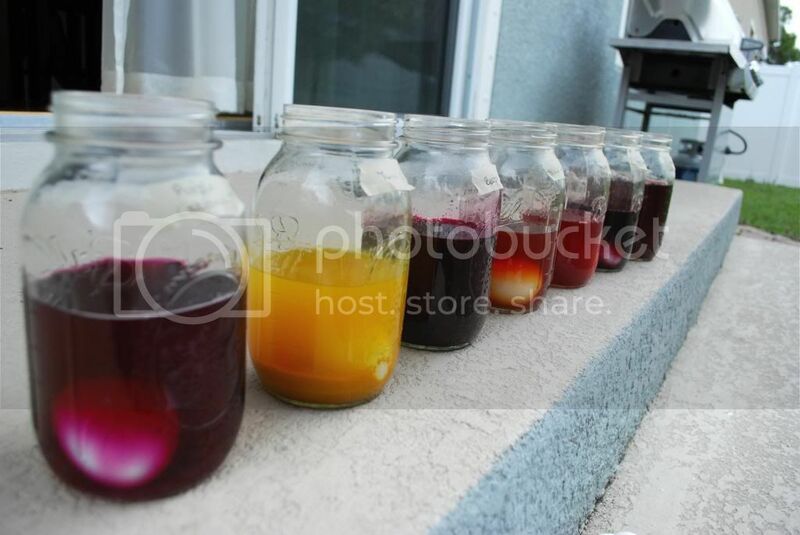 To dye: soak eggs in dye overnight or for at least 4-6 hours. 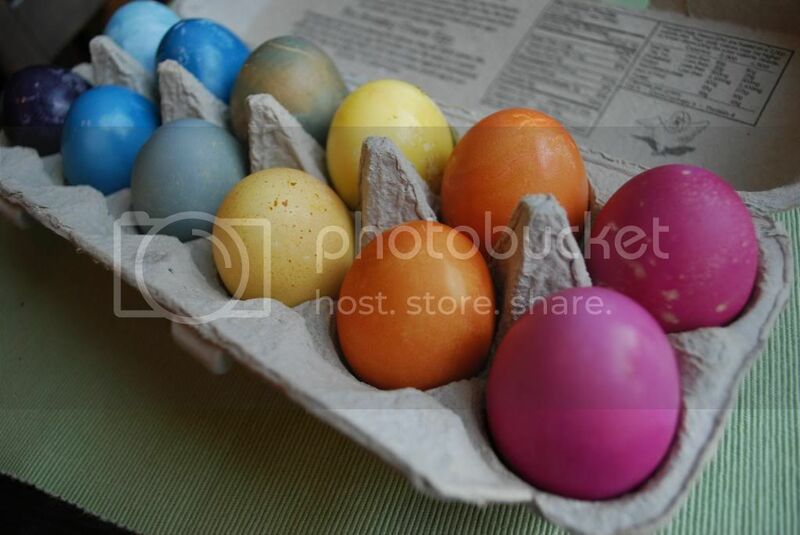 Since the dyes are all natural, you can expect the eggs to fade or change colors in the fridge. If you want to keep your colors vibrant, rub them with a little olive oil- this will also give them a little deeper of a color. I'm ok with the fading and I actually think it's kind of fun to see what happens! This post is shared at Homestead Barn Hop, Natural Living Monday, Tastful Tuesday, Allergy Free Wednesday, Real Food Wednesday, Gluten Free Wednesday and Fresh Foods Link Up. Wow! You got some really intense color! That's awesome! Thanks Andi, I was really happy with how they came out this year! This is awesome! 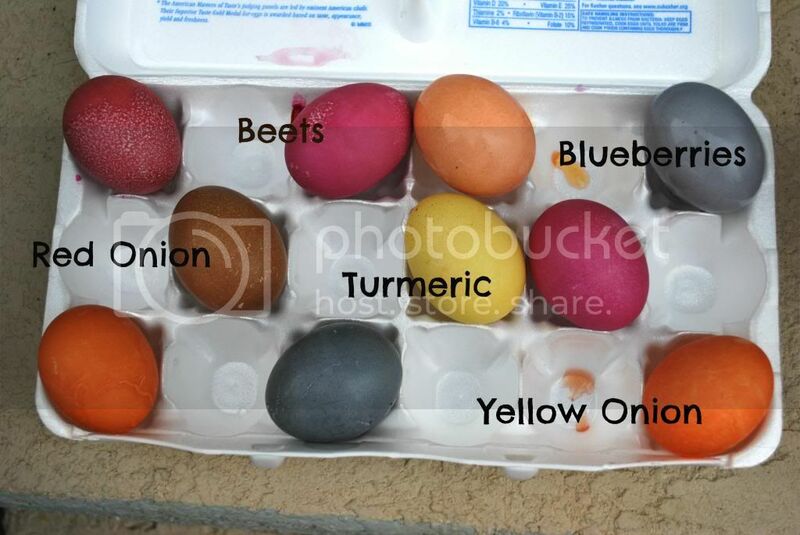 I am planning on dying Easter eggs with my daughter this weekend and wanted to do it with natural ingredients. No food dyes allowed in my house, either :) Thank you for the tutorials - I am excited to try this! I will have to share this on my Pinterest and Twitter. Thanks for sharing this on Natural Living Monday! Your colors turned out SO brights!! I'm amazed! Thanks for linking up to Tasteful Tuesdays! love it! Really appreciate you stopping by my blog! I’m trying to keep in better touch with my linkers/readers… If you already follow me, please let me know I will find your blog on Bloglovin (I’m transferring my follows there)if you don’t follow in any way, would you consider following via GFC or other method? 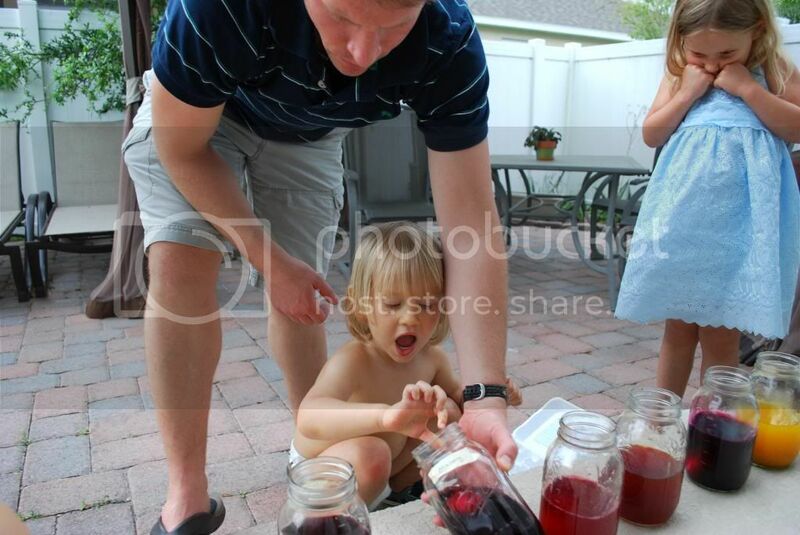 Dyeing eggs with natural dyes is so much fun! 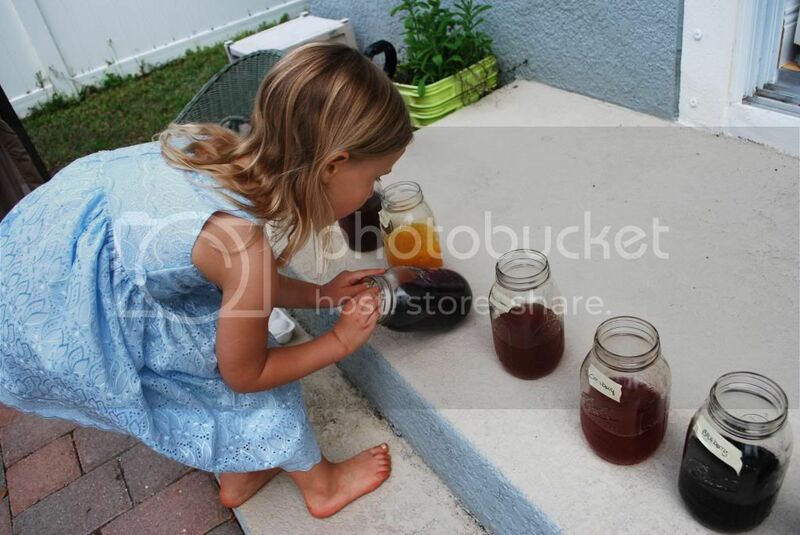 I love the pics you took of the great set up you made for your kids to check on the process. And you got such nice colors! Thanks for sharing on Natural Living Monday! Thanks for this! What a great guide. Thanks for sharing on Natural Living Monday! Your eggs are beautiful! Thanks for posting!